The EMU project establishes a 3D point mesh framework spanning 52 million points and global measurements of six key variables over a 50-year period of the ocean's water column. Oceans are critical to the well-being of Earth and its inhabitants. They are the repository of almost all the water on the planet; impact climate and weather; are a major source of food, and are the highway upon which global shipping travels. Yet, remarkably little is known about oceans. Only 5 to 10 percent of oceans have been explored in any detail. To ameliorate this situation, the Group on Earth Observations (GEO), an intergovernmental partnership that seeks innovative solutions to global challenges, commissioned a global map of Ecological Marine Units (EMUs). This map will support the wise use of ocean resources and the preservation of environmental resilience by providing a framework for understanding processes and detecting change. Released in September 2016, the EMU project was created through an innovative public-private partnership led by Esri and the United States Geological Survey (USGS) in collaboration with NatureServe, the Marine Conservation Institute, the University of Auckland (New Zealand), GRID-Arendal (Norway), Duke University, the Woods Hole Oceanographic Institution, the National Institute of Water and Atmospheric Research (NIWA), the United States National Oceanic and Atmospheric Administration (NOAA), and the United States National Aeronautics and Space Administration (NASA). The EMU project establishes a 3D point mesh framework spanning 52 million points and global measurements of six key variables over a 50-year period of the ocean's water column. The creation of EMUs was a big data project. EMUs are composed of an aggregation and computation on an unprecedented scale. Climatology data was extracted at ¼ degree by ¼ degree (approximately 27 kilometers x 27 kilometers at the equator) intervals at variable depths before being spatially analyzed and clustered using a multivariate statistical method and then verified by leading oceanographers. 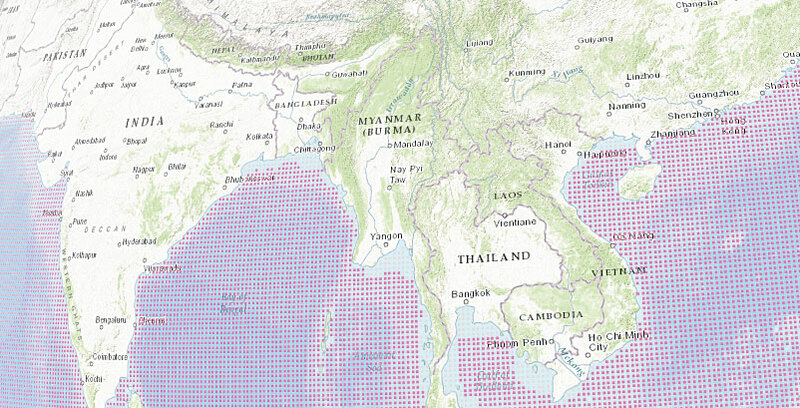 The result is a standardized, rigorous, and ecologically meaningful set of ocean ecosystem units that may be used as a basemap with other GIS overlays produced by various organizations for climate change impact studies, biodiversity priority setting, economic and social valuation studies, research, and marine spatial planning. In describing the unique value of EMUs, Dawn Wright, Esri chief scientist who led Esri's efforts on the project said, "The strength of EMUs is that they differ from existing maps of marine ecoregions or biogeographic realms by being globally comprehensive, quantitatively data driven, and truly 3D. Rigorous statistical clustering produced 37 physically and chemically distinct volumetric regions where the chemical properties most likely to drive ecosystem responses are readily available to all interested MPAs [marine protected areas], conservation-minded organizations, academic institutions, or citizen scientists. With these insights in hand, individuals can gauge indicators of positive or negative trends and use data to make informed decisions that preserve marine environments." EMU Explorer apps were developed so the EMUs and the original NOAA World Ocean Atlas data could be explored using a web browser or mobile device. 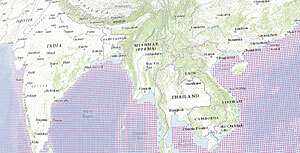 The authoritative World Ocean Atlas produced by NOAA is the primary data source for EMUs. EMUs are an open, accessible data source that can serve as the basis for further marine spatial research by giving scientists and conservationists better access to knowledge regarding marine ecosystems. The Ecological Marine Unit (EMU) Explorer apps were developed so the EMUs and the original World Ocean Atlas data could be explored using a web browser or mobile device. Analysis of the entire water column is inherently a 3D application and EMU Explorer apps provide that third dimension, making complex data more understandable and thus making it available for use in the classroom and the field. By providing ready access to this data, EMU Explorer is a powerful educational tool that can be incorporated into classroom and laboratory exercises, illustrating the connection between human actions and environmental effects. Although the EMU Explorer apps and EMU layers were made available in the Living Atlas of the World in 2016, the project continues. A global delineation of Ecological Coastal Units (ECUs) at a much finer spatial resolution, as well as global ecological freshwater ecosystems (EFUs), is planned. The creation of EMUs is a tremendous step toward the goal of not only comprehensively mapping the ocean but also understanding how the earth works. EMU complements the Ecological Land Units (ELUs) released in 2014. ELUs defined and modeled terrestrial ecosystems as unique combinations of bioclimate, landform, geology, and land cover. 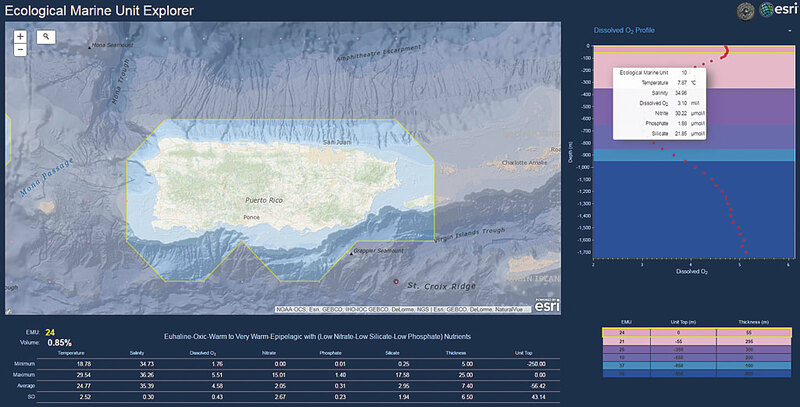 ELU data can be explored using the Eco Tapestry app in a web browser and as layers in the Living Atlas of the World. EMUs and ELUs are part of Esri's continuing efforts to develop the framework and tools that support basic and applied science. These efforts spring from Esri's commitment to develop GIS technology that promotes understanding the earth in ways that are profound and lead to action. Just of few of these efforts: including scientific Python modules with ArcGIS; developing an R-GIS community; promoting citizen science through apps such as Survey123 for ArcGIS; and participating in the Federal Geographic Data Committee Open Water Data Initiative. To improve access to rasters stored in the cloud, Esri contributed to the open-source Geospatial Data Abstraction Library (GDAL) implementation of Meta Raster Format (MRF) and made its patented Limited Error Raster Compression (LERC) technology freely available to the geospatial and earth sciences community. Esri Press has published books, such as Ocean Solutions, Earth Solutions, Second Edition, that promote the use of GIS for scientific research. EMUs grew out of a collaborative effort. The insights produced by this effort would not have been possible without valuable input from a large team of contributors. Esri hopes this collaboration will not only continue but also grow, and it encourages scientists to expand EMUs with their own data to make possible a more current and comprehensive picture of the oceans. Access to web services and related products for use in related projects is available. Download the EMU data. See current information on the project at the EMU community on GeoNet.